I love to read cooking recipes. In fact, it is one of my hobbies. When referring to recipes, it is normal to see words like seasonings, marinades, sauces and few others. One particular word that caught my attention was spice rub. What is spice rub and how do we define them? I am pretty sure you would like to know too. Read on to find out all about spice rub and how to make your own. First and foremost, let’s understand the difference between seasonings, marinades and rubs. When these are used correctly, it will make your cooking experience more satisfying. Seasoning is a general term for anything used to enhance the flavours of meats, vegetables, potatoes, eggs, pasta and others. A combination of salt and pepper is technically a seasoning. Add a little olive oil, vinegar and herbs, you have a marinade. Combine salt and pepper with sugar and spices, you have a dry rub. Add a little mustard, you have a wet rub. Spice rub is a mixture of ground spices. Combined with salt, for flavour, and sugar, for caramelization, it is made for the purpose of being rubbed to raw food before they are cooked. Herbs may also be added to the mixture. 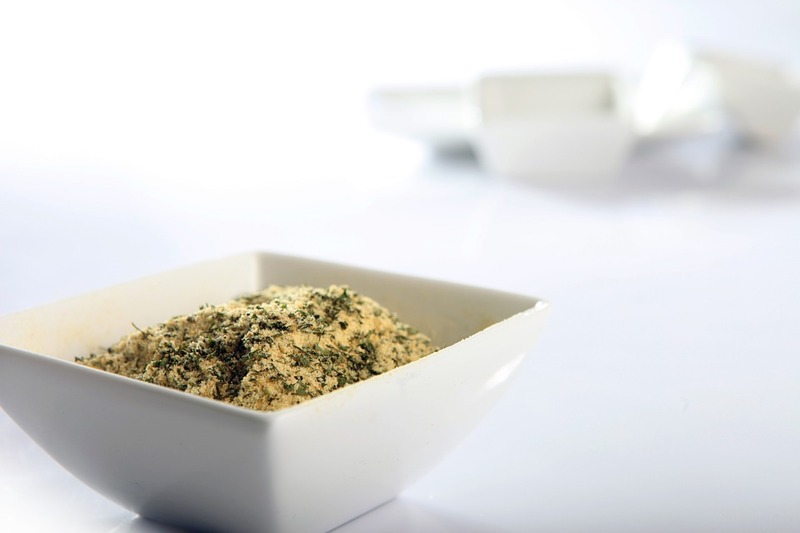 Spice rubs are mainly used for preparing meat, poultry and fish, giving it lots of flavours and a crispy crust. The most common cooking method for these foods are barbecuing, grilling and roasting. 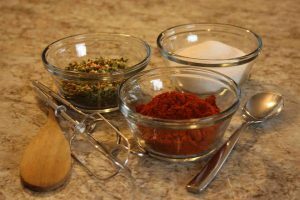 Understand the 4 basic elements of spice rub and you will have an exciting experience creating your own signature blend. Salt and Sugar are for flavour, balance and caramelization. The ratio of salt to sugar needs to be taken into consideration depending on what food it is for. A higher ratio of salt works best in rubs for beef, fish and wild game, while those with more sugar are appropriate for pork. Choices of salt include sea, kosher and seasoned salt such as garlic salt, onion salt or celery salt. Sugar can be white or brown, where the later adds colour and flavour to barbecue. Pepper is another ingredient to balance the mixture. But most importantly, it adds heat. Depending on your spicy heat tolerance, add ground pepper to the salt and sugar mixture bit by bit till it reaches the desired taste. Pepper can be in the form of white pepper for gentler heat, black pepper for a stronger flavour or cayenne pepper, also known as red pepper that provides instant heat. Base Spices bond the salt, sugar and pepper mixture. These spices form the base flavour of the mixture. Signature Flavours are your desired flavour. This creates your signature blend, your “secret recipe”. Once all the ingredients are determined, combine them and sift everything into a bowl and whisk till well combined. A faster way is to put them into a food processor for a thorough mix. Spice rub can be made in advance and can last for up to six months in an airtight jar placed in a cool, dry space. Pre-mixed rubs are easily available in any grocery stores. On the same note, they are easily made at home. Commercial rubs are loaded with salt and chemical preservatives which does no good for our health. Made at home, the salt content is controllable and preservatives omitted. Furthermore, it is a lot cheaper to make at home and reduce wastage too, since the portion is made according to our need. Click here to find out ways to reduce salt intake. The name “rub” says it all. It is rubbed onto meat. Ensure meat is dry before rub on to get the best outcome and a delightful caramelization. Give the meat a good rub and allow it to rest at room temperature for at least 30 minutes. When grilling, the sugar covers the outside of the meat, allowing the salt to draw out the moisture while the spices penetrate and add flavour. This makes the meat tender, juicy and delectable. Spice rub can also be applied to vegetables, potatoes or pasta. Simply sprinkle it over the dish before cooking to allow the herbs and spices work into the dish to enhance its flavour. The wet rub is basically a dry rub with added moisture. This allows the seasoning to stick together. It is recommended to combine two parts dry rub with one part wet element. Choices for the wet element includes olive oil, honey, mustard and yoghurt. Dry rubs are best used for cooking meat that has natural flavour such as shrimp, seafood, chicken and pork tenderloin. Meat that does not need to be tenderized should use dry rub too. Example, a premium cut of steak. Fatty cuts of meat is another choice for using dry rubs, as they do not need extra moisture to stay tender. Wet rubs are best used for grilling meats and vegetables that can benefit from the added moisture such as flank steak, potatoes and zucchini. Meat with bone in, such as chicken drumstick and ribs are cooked low and slow. Thus, wet rubs work its advantage. Are you ready to make your own spice rub recipes? Check out what spices you have in your spice cabinet. This is one of the many ways to utilize herbs and spices in storage. Waste not. There isn’t a hard rule to follow when making spice rubs. 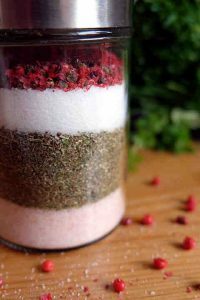 You may reduce the salt, increase the pepper or oregano, even be adding another of your favourite spice or herb. Go with your palate! Next time you are invited to a barbecue, bring a jar of homemade spice rub. It will make a delicious gift! That’s All about spice rub for Now! In the beginning, the purpose of this article was to find the answer to my question, What is Spice Rub? Well, I know now and found more useful information too. Knowing what is it, how to make it, creating my signature blend and how to use them. Did this help you? Learning and sharing with everyone is as satisfying as cooking with herbs and spices to provide a delicious meal for my family. Share your experience with spice rub here. Do you have a secret recipe? To share? Well, it will not be a secret then, will it? Anyhow, please feel free to drop a line or two in the comments section below. Spice rub ready! How about a barbecue grill? Do you have one already? If not, check out my Weber Charcoal Grill Review. If you need an organizer to sort out your spices and herbs, click here to find the Best Spice Rack Organizer that suit your needs. Hey Sharon, What a good article on this topic. I am not a cooking guy or not my hobbies but I always wanted to learn to be creative in cooking. Somehow your writing inspired me to take action and get my hand dirty. Very different with what I learn from others recipes. I am going make my own spice rub recipes and will let you know what’s the outcome soon. Yay! Go on Maxx. Get cooking! I am glad you decided to do it. Am sure you will impress your family and friends with your new found culinary skills. Thank you for visiting my site and do come back to learn more on herbs and spices. Also, share your experience with us. I’ve never heard of rub spice until I came across your website. And I am so happy I did find your site! Just a question, please regarding the brown sugar. If I put coconut sugar or silane instead of brown sugar, will the spices still be the same taste? If you are making a wet rub, use honey or maple syrup. I am sure it tastes wonderful. Thanks for a lovely article about spice rub, how to make it and add it to your dishes. I am a keen cook and love to find new ways of adding flavor and interest to my recipes. You have a great amount of details and clear steps to how to make it perfectly. I am going to try it this week! Thank you for visiting my site. I am sure you will make a delicious dish. There’s a lot more to spice rubs than I ever knew! Thank you for the thorough information. I really liked the comparisons to seasonings, marinades, and dry rub vs. wet rub. Great information! I love to cook, and although I don’t cook a lot of meats on the grill, when I do, I like to make sure they are seasoned properly. Your post did a great job of covering everything! I do like spicy heat too. But my younger son has not learn to take it in. On the other hand, my elder daughter seems to be doing good. 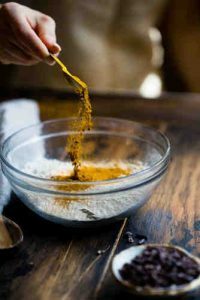 You choose a good topic for this article, I am sure many people were not aware what a spice rub was before now including myself. I do enjoy cooking my own meals from scratch with herbs and spices to enhance the flavor, to be honest I never heard of a spice rub before today but you can be sure I am going to be using this in my meals from now on thanks to you. You are most welcome Jeffrey. Glad to be of help. I love cooking and have made several different marinades over the years. Two ingredients I often use when making a marinade are turmeric and lemon juice. What would you recommend these ingredients work best with and what is the ideal length of time to marinade for when looking to tenderise meat. Turmeric and lemon work well with chicken. Marinade 2 hours for chicken breast. If whole chicken, marinade for 8 hours or overnight. It works well for fish too. Marinade 15 – 30 minutes for seafood, not longer than 2 hours. These two are a common dish in my household. My kids love them. Hey Sharon great article you have there, very informative! Sometimes we ignore everyday things and definitions and think of them as common facts. I’ve never thought about the differences between spices, seasoning, wet/dry rubs and spicy rubs. You also share agreat, basic spice recipe. I like spieces and I have tons of herbs available since I am from Greece. I’ll definitely try those out! Thanks for visiting and positive words. I will be writing and sharing more about herbs and spices. There are so many uses for them. Do drop by again. Hi Sharon Thanks for the great information on how to use various spices. I like to cook and trying to come up with different ideas day in and day out can get to be a challenge. I have in the past grown my own herbs, dried them and used them. One of my favourite herbs is rosemary. I am really lazy when it comes to using this herb. When I make a meatloaf I will cut a sprig of rosemary and place it in the middle of the meatloaf. When the meatloaf is cooked you can just pull out the piece of rosemary from the meatloaf. Thanks for sharing your experience here. When it comes to rosemary, usually I use the dried form as it is easier to obtain. We love making and using spice rubs especially for smoking pork and beef. We have been doing this for number of years but I have yet to make a wet rub, great idea! You obviously know your spices and we often use a number of the variations you list, mostly leaning towards a hotter rub using cayenne and cumin liberally. What liquid would you recommend to make a spicy wet rub, apple cider vinegar? spicy mustard? Nice lesson for us wannabe chefs out there. I am glad you enjoyed making your homemade spice rub. Apple cider vinegar and dijon mustard are the common liquids to make wet rubs. You may consider adding Worcestershire sauce, hot sauce / Tabasco sauce, or even beer or Bourbon to your wet rubs. Tell me how it turns out by coming back to this section. I am excited to know your “secret” recipe. Beautiful page and a wonderful article. I learned a lot – Thank you! Did I miss is or did you address if the dry rub mixtures can be used as seasonings? From the feedback on the page, it is clear that your message came thru and your readers enjoyed the content. Technically, a rub is a combination of seasoning and sugar is for caramelization. If you omit the sugar of the dry rub mixture, yes, it can be used as seasoning. But you may need to tweak the proportion of each ingredients, for example the amount of salt which might need to be reduced. Create your own seasoning as you would the spice rub. Yet another great adventure coming to your site. Hmm rubs and marinades, so interesting to learn the difference and recipes. I was wondering what can be used for a rub that does not have any sugar in it? I don’t do sugar. And as a vegan I was thinking it would be so fun to do more rubs on veggies. Would you have a suggestion? So do love reading your posts. Always informative, enjoyable and engaging. Can’t wait to see what you write about next. And I can just picture you cozying up reading recipes. Do you so enjoy cooking like you enjoy reading the recipes? So happy to see you here again. The sugar is for flavour and caramelization, browning of the meat and to form the crust – typical of grilling and barbecuing. You will be glad to know that sugar can be omitted in any of the spice rub recipes. There is no hard rule to follow in making your own blend. Try the all-purpose spice rub recipe here without adding the sugar. See how it turns out for you. On the next batch, try to create your own according to your palate. Share with us what you have created. Now, go on and have fun creating your blend. The warmer season is here. I love to do a lot of smoking and BBQ in this season. Spice rubs work great for this. I like your helpful tips. Too often I find myself buying them when what I need is right there. You are so right about the cost saving! The little packs of rub in the stores are so expensive. Do you have any salt cutting tips or do you think it is necessary? I am trying to cut down on sodium and rubs tend to have a lot. Yes, Christina. Those store-bought spice rub can be pricey and it doesn’t store very well once it is opened to use. Making your own spice rub, you are in control of the amount of salt. Salt is for flavour and you can reduce it, adding more herbs and spices instead. I have written an article on ways to reduce salt intake which you may want to read. I like to BBQ. I do use a rub on my meat from time to time to make a different taste. You have given me the information I need to make my own rub to my taste. I like the fact that you can change the formula for each type of meat and give your guest something different. Now to go and experiment on my family with some of your suggestions. Glad that this article has given you much information to make your own. Am sure it’s gonna be interesting and I am interested in what you have created. Do share with us. This article gets my imagination going! We have a television in reception at work and often put on the cooking shows. I don’t really get to watch but have seen parts of the grilling episodes where the cook is making his delicious rub for something. I always wish I could jot it down. Now I have a guide right here that I can keep! Now you can make your own signature blend. Share with us what you have come up with. Sharon this post sounds delicious. I love dry rubs and its great to learn that these are easy to make at home, I will have to try your recipe. Thanks for sharing. Thanks for dropping by, Tara. Isn’t it great to know that we can easily make it at home? Let me know how it turns out for you.